Legacy follows the story of Rebecca ‘Rose’ Healy, whose life seems to all be falling perfectly into place. But little does she know it's about to take an incredibly dark, life-changing turn. When a secret is unearthed from deep within her family, she must take up the reigns left behind by her late father, who was killed in a vicious attack by a werewolf in front of her very eyes. Rose does not know who she can trust; rumours of a spy within the group of hunters kick her into action to track the traitor that has slowly destroyed her perfect little life. The book finished with an intense confrontation, that the less said of it, the better the ending. This story really doesn't hold back in any department and is most definitely not for children. With tonnes of extreme violence, this gruesome tale deals its audience a very descriptive experience that puts a fantastic, adult twist onto a classic cult fairytale. Within the first chapter, its straight in with the blood, guts and gore - lovely! The underlying tale comes across as a thoroughly enjoyable modern day retelling of Little Red Riding Hood. It’s an emotional rollercoaster from start to finish, pushing Rose to her limit, and for the audience, a real struggle to put down. This is the sort of book you would read by candlelight on a cold winter's night accompanied by a pot of tea - the ideal setting of course, but it also translates to being very readable on the morning tube, taking its reader into the world of the supernatural. This is the second publication from Johnson, the first being a collection of dark short stories and poetry. But this first fiction feature is a triumph in incredibly visual storytelling. Each description detailed to give the audience a truly vivid image of the vicious scenes in question. One of the most engaging parts of this story is how it constantly throws twists and turns, leaving you to ponder for more. I found it an intense read and it left me squirming and, quiet literally, has the hairs on the back of my neck spiking up on several occasions; what a brilliant experience! 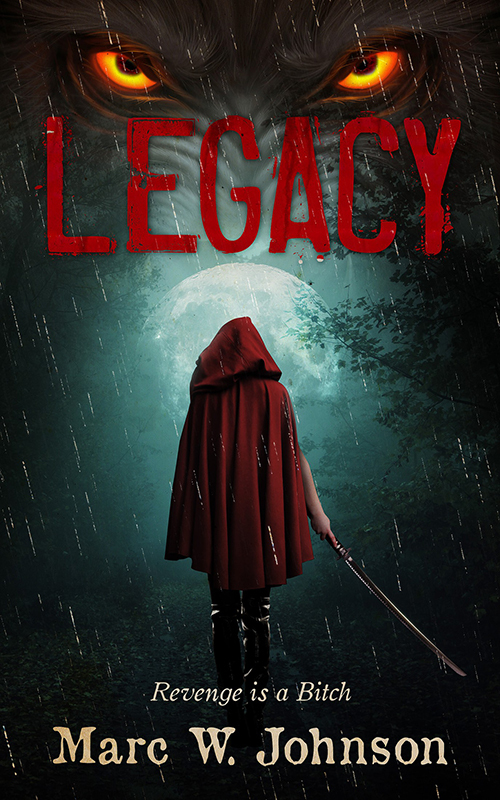 Legacy is a chilling and thrilling read which is sure to make you cringe in horror as the story unfolds. I highly recommend it for a multitude of audiences. Whether you enjoy a good old horror story or if you’re a fan of the more fantastical, this book will cater to your thrill-seeking needs. I look forward to seeing more work emerge from Marc W. Johnson and I can only hope it is as exciting as this read. This review has been tough to write as I really don’t want to spoil the story for anyone. Just pick it up, get reading and get enthralled by it! + Legacy is Out Now. + Follow Marc W. Johnson on Twitter.